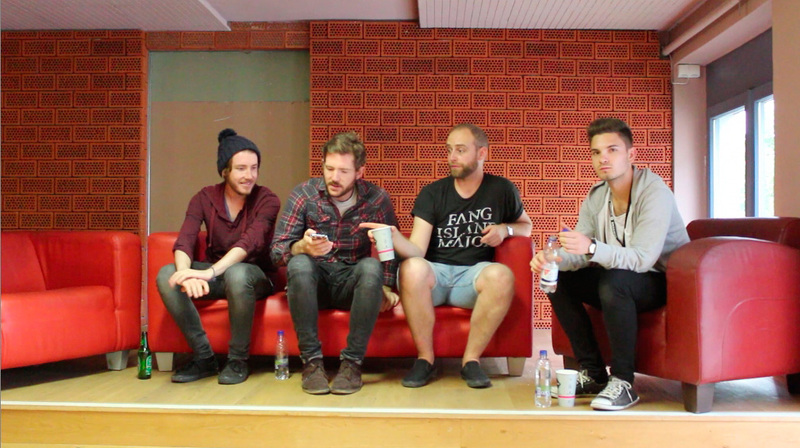 Such a pleasure to do a little interview with those four lovely guys from Fenech-Soler on Wednesday in Munich! The British band is currently supporting Paramore on their tour! So first, how would you describe your style of music? Ben Duffy: Well if it would be about clothing, probably unwashed and stinky (laughing)… but musically..
Ross Duffy: It’s electronic pop music really. How’s the tour with Paramore going so far? Ben Duffy: Very well actually, they have been treating us very well. Fans have been really good, venues are really big, yeah it’s been great so far, brilliant. Have you got a favourite place for writing your songs? Daniel Soler: We did a lot of writing from the album at Norfolk which is at the countryside of the UK, there was like no phone signal and stuff, but it was a really cool place for writing music yeah. Apart from that it normally happens in the bedroom or in some kind of places like that. Which musicians inspire you most? Ben Duffy: Hm, I think that’s for all of us individually..But well we play electronic music, there is also a lot of upcoming producing stuff we listen to and we like lots of DJs as well, so basically electronic music, but we listen to lots of different bands…which bands do you like Andrew? Andrew Lindsay: When we started the band we were all quite a lot into stuff like Daft Punk, Chemical Brothers and quite a lot of electronic stuff, but as we played a lot more gigs, our taste kind of got off in lots of different directions. So I think we ended up listening to quite a lot different stuff, but that’s what kinda brought us together in the first place I think. Andrew Lindsay: For me it is travelling, getting to a few new places and yeah, I think that’s the main part for me. 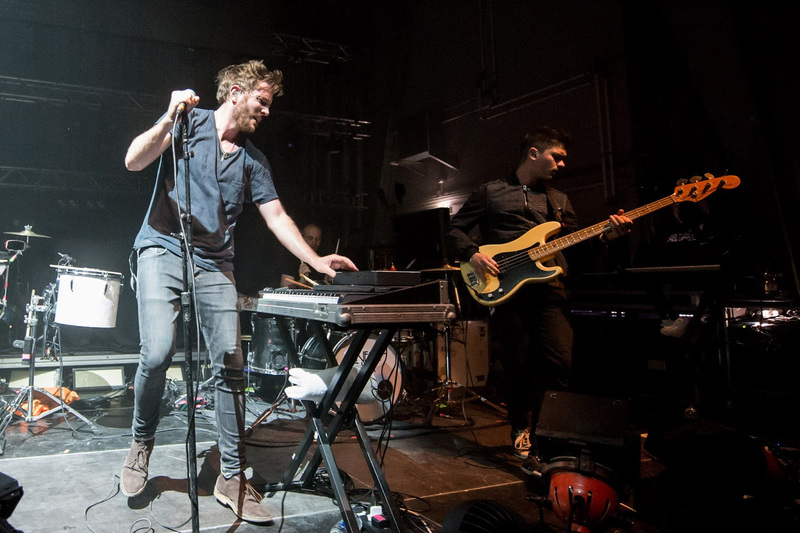 Daniel Soler: I think for me it is playing in front of so many different audiences, the stuff we been working on for so long and seeing their response and yeah…the gig, being on stage. Ben Duffy(joking around): haha, the gig. ‘’what’s best on your touring?’’-‘’well the gigs’’ well if it wasn’t for that we probably weren’t there ha! When you were 14 years old your favourite musician was…? Andrew Lindsay: Hm probably for me smashing pumpkins… that was about that time, when I was 14. Ross Duffy: Yeah totally, I think we became friends over stuff like that. Andrew Lindsay: But stuff like Michael Jackson as well. Which advice would you give young musicians who are just starting with doing music on their own? Andrew Lindsay: Hm maybe just keep going, don’t take it too seriously and kinda just keep playing. Play lots of gigs so you get to know about it. Ben Duffy: I think we as a band we found our way with just trying stuff out. Now we’ve been doing it for a while and I think when things go wrong, or at stuff like industry decisions, you just lean by your mistakes, so it might be the best by going on and enjoying what you’re doing. Kind of trusting your instinct. Be happy. Andrew Lindsay: Oh and I’d say, from my personal perspective, try to record everything you ever do, haha cause I always tend to forget lot of my good ideas… Try to do that I’d say, cause the best ideas probably won’t come to you when you’re actually working, they might come to you when you’re walking to the bus or something like that. That would be my advice…Remember stuff, by recording it ha! Thanks a lot to you guys, also big thanks to my friend Sarah who took the pics at the interview!